Back in January, I needed a black purse for my father-in-law’s funeral. I found one at Costco that, well, I wasn’t sure it would hold up well past a year but it was certainly not expensive given that it was leather and it was big enough for traveling. Good enough. I needed one immediately. I was glad to have it. There was some fraying on the straps ten days later. One simply came unglued at five months. All the more incentive to get my Charlotte Ronson knitting bag rehabbed, and I did that, but meantime out of curiosity I looked up Kooba. One of my daughters had a Kooba bag that was a very nice leather, well designed, which was part of why I’d bought the one I did. Hers was similar to this one and it was made to last a long time. Their website said they warrantied any bag bought at a full price outlet for one year. So I sent them a question: did Costco count as a full price outlet? (I mean, I’d paid a tenth of the list on that other and I’d expected going in that I was only going to be getting what I’d paid for.) My guess was the answer was going to be no, and reasonably so. The person who usually dealt with such customer inquiries was out on a medical emergency. Which I found out when the vice president of the company personally stepped in after a few weeks and asked if anything had been done yet? It is the same as the one I bought–except that the leather is better. They really didn’t have to do that. But I’m very very happy they did. Ugly Christmas Sweater season is coming (but is still far enough away that prices haven’t risen yet) and my 20+ year old one was handed down several years ago to a teen who wanted to wear it in a play and then she found she loved it so I gave it to her. It was as formal a one as I’ve ever seen. I happened to find this on swap.com, the screaming opposite of my previous one, and for $3 it was mine. It is both tacky (why are the tree and the wreath sunk down in their diamonds unlike all the centered motifs?) and bright and, well, pretty, in a way, and best of all it made me laugh. The beads are bright and big and glittery and a certain baby who will be nearing three months by then will want to try to reach for them all. It was in near-perfect condition–just let me steam that one side that wants to curl under. There are even Christmas bells and holly on the back. Swap.com’s mission is to keep good clothes away from the landfill. The commission paid is low enough that nobody’s going to steal from stores to sell there, as has been known to happen on Ebay; this is where you send good stuff out of your closet that you hope will find an appreciative home because it deserves it. Basically, it’s a national garage sale, hence the classic crewneck silk/cashmere sweater I got for $2.30 and the deep green cashmere tunic-length perfect sweater for $7. Which I’m actually more likely to wear holding the baby: they are definitely snuggle-worthy, and hand washing is easy. Prices sag on things that stay too long. Sales happen. Shipping is always $5.99 or free. 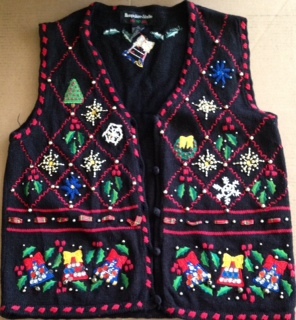 Well, look at that: Ugly Christmas Sweater has its own search on Swap. Someone creatively listed a plain red crew as an “Ugly Christmas Sweater kit.” Go to town! Apparently the blog still has some broken parts to it after the latest update. If this looks normal to anyone–assuming you can even see it–I’d love to know. Thanks. Wait–back up a bit. When I was home from college over Christmas break when I was 19 or 20, my dad surprised me by telling me he was going to take me shopping for a pair of boots for Christmas; he knew it would be my first pair ever. It was cold and snowy where I was going to school and he wanted my feet nice and warm. Besides, hey, boots! Took me a moment to get over the shock. My dad. Wants to take a daughter. Shoe shopping. Brave man. What I ended up with was inexpensive waterproof synthetic ones. One, because I knew the folks had three kids in college that year, and two, because trying to buy my feet anything was hopeless anyway, so once I found something, anything, that I could at all get my feet into I knew that was as good as I was going to get and the fact that these were waterproof seemed practical. Finding something that actually fit my 6.5EE and high arch was completely out of the question. Back at school, I found my feet hurt pretty fast wearing those and I only wore them to get from my apartment to campus. And only a few times, with regret at not letting my dad push me to try harder. I should have skipped getting those altogether, which I’d known all along but I just couldn’t let him completely down. Fast forward to when I had kids in elementary school. The PTA in our school district ran, at the time, a wardrobe exchange in order to pass clothes on to those less well off, while covering for their pride by presenting it as a way to offer warm clothes for those going to Tahoe who only needed to rent snow clothing those few days out of the year. Wash them, bring them back, done. So anybody could rent outfits for their kids for a few bucks and anyone in the school district could buy them for about that who needed to. The funds went to cover the rented trailer they ran the operation from. So I brought in some warm outgrowns for the cause one fine day. Someone had donated these shearling-lined horsehair boots that look like a Westie terrier about to be told to get down off that chair. I thought they were hilarious and tried slipping one on, and then the other, and by golly I could actually get my feet in them! What a great Halloween costume! Besides, my oldest was getting to the age where it was my job to embarrass her, right? The woman was incredulous. You LIKE those?! Nobody checks those out. They’ve just sat there forever. You want them? Take them! Well, that wasn’t quite fair, so I went home and got those old tall rubbers and exchanged them pair-for-pair. They were happy, I was happy. The fact that I wear European 37 and these were stamped 39 40 on the bottom–US 8-9.5–three full sizes too big, no wonder I could get them on. But those polyurethane ones from back in the day left a lasting impression: I don’t do boots. Period. Although I sure wished I did when I was in DC January a year ago and it was five degrees out with a strong wind and we were trying to hike the C&O Canal in the cold (not for very long). As if. Come on, they don’t exist now any more than they did then. But we had that conversation every so often these past few years and I always wondered if that was actually so. I went to a specialty shoe store that advertised wide widths. No dice. I searched Birkenstock’s online store. Their American importer? Nope. And then I found a German Birkenstock store. They had a few pairs left of a now-discontinued style. I knew that ordering from Germany was going to cost me a whole lot in return charges if this didn’t work, I had no idea how they would handle it if I did, the cost was in no way cheap but I thought how much Michelle would love it. I thought about getting to tell my 90-year-old Dad that, hey, Dad! I did it! I finally got those boots you wanted for me all that time ago! And so I took a deep breath and typed what I needed to type. I put one foot in. I put the other foot in. Walked a few steps. And then just about shouted to the rooftops, THEY FIT!!!!!!!!!!!!!!! They’re not high boots, they’re more like high top sneakers, but wearing something above the ankle is a whole new thing here as it is. The doctor who treated my broken bones in November wanted me to be wearing something like this instead of clogs, and there you go. I keep laughing at the name of the boot: I have a Bartlett pair. We heard a thunk this afternoon, and opening the door, I found a box: it said New Balance. The mailman hadn’t even driven his truck away before I read the label, laughed, and started walking next door. He saw me and was startled–Did I–? No problem, I laughed, it just helps me keep in touch with the neighbors. Jim opened at my knock and I handed him his box. “Those aren’t my shoes, mine came yesterday,” pointing at my feet, and he laughed. I wonder if he was as excited about his as I was about mine. I mean, you just don’t want to miss out. You pay for what you get? A 45-mph expressway, divided, two lanes each way. A large and expensive SUV pulled over to the side where there was a bike lane but no real shoulder and driver and passenger doors were wide open, the driver’s actually jutting into the lane of traffic. He couldn’t pull far enough off because there was a line of flowering dense shrubbery you often see planted around here on such roadways to stop out-of-control cars. And behind the SUV was a woman in a long white wedding dress, her hair swept upwards and elaborately braided for just such an occasion. She looked gorgeous. And she was creating a beautiful bouquet in her left hand from the pink flowers she was stealing from those bushes with her right. I watched her take one as my car approached, staying in the left lane to avoid his car door. Every part of the oleander plant is very poisonous. Our house had one when we bought it and we had little kids and got rid of it for their safety. If I were the groom I’d keep a sharp eye on that one. Except that that was probably him coming around the front of the car to join her. Old stuff to tinker with. Complete with original case. It’s surprising sometimes what someone else really really wants when you really really don’t. And then another person. And another. And another, who said it looked cute. But then the first two responders to my Freecycle.org post suddenly realized that the wife had beaten the husband to the request but hey, they assured me they could work this one out, truly. Well then, there’s no wondering whether one spouse will be annoyed at the other for lugging such a thing home. I made sure they knew it looked like it needed an orthodontist. They laughed. 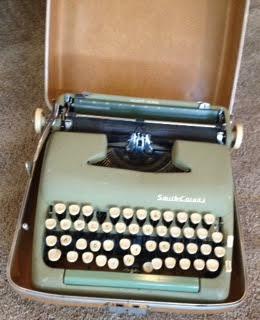 So our Smith Corona Super-Silent manual really is going to a good home!
. Thank you Davies Appliance. We made lemon sponge cake to try it out: even and perfect. But they have to come back tomorrow to rewire the circuit breaker so that cleaning both ovens at once (not that we intend to do that) doesn’t cause problems. They also had to cut the lower cabinet drawer to fit it in and–it didn’t come cheap but they do it right. The installer looked at the dishwasher a moment for us and said whoever had brought it had bashed in the top, which had sprung back, but it was why we’d never been able to pull out the third rack at the top. It wasn’t that we’d been doing anything wrong. I knew exactly where the sales receipt for it should be (and the one for the oven now is). It wasn’t there. Well no real problem, I went online to my account–where Sears had no record whatsoever that we’d bought that dishwasher from them. Huh. I knew they didn’t do extended warranties, but making it so they don’t have to be hassled over the original manufacturer’s one either? That’s pretty…broken, however it happened. I tried their chat. Nope, no record. He recommended calling the store. We only have two months left on that warranty. The guy at the store on the phone told me that for him to mail me a new copy meant its having to go through headquarters and there was no knowing how long it would take. He said that part again for emphasis–the implication being, they’ll string it out till your warranty’s over. It doesn’t matter to them. There was nothing for it but to go there, twenty-one miles each way across Bay Area traffic, for a new copy of the receipt in person. Which he was glad to give me. They’ve got a good guy working there who does right by his customers. It wasn’t till I got home that I found that nowhere on those two pages that printed out does it say the actual word SEARS. Wow. If I have to drive back down there again to get an amended copy, I do, but, hopefully this will do. But wow. I will never, ever buy a major appliance from them again. Which is a shame, because the people who work the floors that I’ve encountered have all been people whose jobs I want to support. Glad I bought the oven from the local family-owned-since-1935 company. 1. Something serious: an article on how the whole Bundy standoff thing has been affecting the fish populations at Malheur Refuge. 2. Something not serious, except that it is in that it’s trying to address a common source of landfilling: a thanks to LynnH for pointing out a (fun!) reusable replacement for the ubiquitous to-go coffee cup. Design your own colorways. It took the little animal a panicked moment to figure out how to disengage and flee from it and me. Actually, the Bundys and that squirrel have a lot in common. Tuesday was, as usual, watering day, as we hope hard for an end to the drought soon. Wednesday, with the plants nice and plump and me away at my lupus group meeting, turned into steal-the-zucchinis day. And not just that: the squirrels tore open the stems of several leaves to get at any fluids they could. It’s been three days above 100 degrees in a row and I guess they’re desperate but I won’t have a plant if they keep that up. They did miss one last zucchini, and I would have given it one more day but I knew they wouldn’t so it’s safely in the fridge now. I wasn’t letting them walk near my caged tomatoes after that. Which meant chasing them away a few times rather than letting them test my setup. Probably because I hadn’t used the squirt gun, one large gray running down the fencetop highway this evening got to the edge of the property, turned around, walked quite deliberately back to its favorite spot up there and yelled at me. Wait. That’s a squirrel sound? That’s way too low pitched. Can squirrels get hoarse? Seriously, can they? The door was open and Richard was home and he opined that it had been a bird he’d heard. Too low for a squirrel. Well, the sound was with it looking at me and stopped when I chased it away a second time and started up again when it came back to that same claimed spot and tried to give me what-all once again for interfering with its meal. Squirrel. Curious. Oh and on a completely different note? I found myself driving behind a Tesla X today: DeLorean-type Gull wing doors, seven-seater SUV, and it seemed to actually have headroom enough for tall people. (Yo! Elon Musk! We need 6’8″ and 6’9″ers to be able to fit into your cars.) I didn’t even know these existed yet! Total fantasyland for us but that is one cool car. We got one of the first Priuses but we’ll have to pass on early-adopter status on this one. Okay, do the click-and-drag on those doors. Do you see what I see? Wallace and Gromit? I’m dog-earing that page. There were about a half dozen years in my life when my children were babies when I wasn’t into knitting. This involves creating tiny pleats in cotton fabric and then embroidering over those pleats and sewing up the little outfits. This especially lends itself to cute baby dresses, and I made dozens and gave many away to other new parents to welcome their little ones. When my lupus started four years later I could no longer hold those tiny needles but I still needed a creative outlet. Something that stayed done in the happy chaos. And that is when I rediscovered my love of knitting. But meantime, my kids had outgrown the various smocked outfits and I had set them aside for future grandchildren. Then we remodeled. It was the seventh year we lived here, and the first six had all been drought years. That seventh was a doozy, though, and I started joking that if we ever had a drought again we just had to get the state legislature to fund remodeling our house again and that would end it–it just wouldn’t stop raining. When our contractor thought he was pretty much done our roof had seventeen leaks, all of them new. It took every bucket we could find while we tried to get that taken care of. There was a leak in an overhead light fixture over here, and over there, water was pouring out a light switch. More from the new sky lights, others just randomly wherever. Fun times. Meantime, those smocked clothes were in a box with a lot of other boxes that got shuffled around depending on where work was being done on the house just then. And one day I discovered that roof juice had permeated that box and those clothes and despite all I could do with a washing machine, those stains did not come out. All that work, all those memories, all that generational anticipation! I couldn’t throw any of them away–they were beautiful, aside from the damage, I just couldn’t. Yesterday I stumbled across this simple little bishop-style cousins dress. It somehow was not stored with the others, as if it were waiting to be discovered, a spokesman for the others. It took me this long to figure this out? Hello, lady, you’ve got grandchildren… I wondered if my niece, now the mother of three little ones herself, might still have or even know about her matching outfit. I hadn’t thought about them in a long time. I think the sense of pointless loss had made me avoid them. I rubbed some Seventh Generation detergent into the spots, put a little more in the sink and sudsed it up at the tap (not too much! It’s a drought! Tell the legislature they’re not doing their jobs!) and put it in to soak. For eight hours. I squished water through from time to time. And look at that. No baby food stains either. I actually missed one roof spot near the bottom, so I’m going to rub more in and do it over. But look at that! Twenty-one years and three grandchildren later and I can actually start passing these down now. I’ve got me some work to do. At long last. p.s. I don’t remember if I used the Ultra Power Plus or their older version; I have both. But they’ve earned the link they didn’t ask for so here it is. A knock at the door. The old dishwasher was wheeled away with our dolly while the other worker stood there with the new one up on his shoulder (!!!) waiting to get by to bring it inside for us. That was at 2 pm and then we spent the next seven hours on the installation. Even he didn’t see any way to get those two top screws into that box that’s supposed to go against the wall under the sink, not with the disposal in the way. He was suddenly glad he’d bought a tube of caulking during the run to the hardware store for the right screws and a level (after an hour of both of us looking for his level)–he would just basically glue it to the wall. We had the two lower screws in, the most important ones, so, hey, that would do it. As he caulked while wedged in at an impossible angle he casually mentioned that I was now going to have to hold it in place there for ten minutes while it set. But wait, I think, there’s more than one way–and so I turned around, laid my back on the floor, and put one foot up against that thing. There you go. Easy peasie. Staring at the skylight straight above, watching the seagull kiting on the breeze. Except that before I could congratulate myself my posterior was already starting to slide across the kitchen and I had to tell him to grab that box quick. I readjusted. I ended up spending the ten minutes holding tight to the cabinet door, still far easier than the alternative. Does this thing come out? 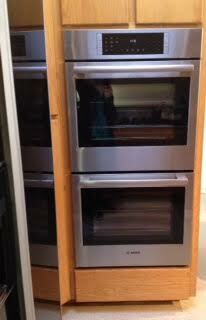 (The third rack at the very top for putting silverware and spatulas and the like into. There’s a silverware tray at the bottom like every other brand, but this was to give you more flexibility with big stuff.) Surely it comes further forward than this? Huh. Let me go check. I googled Bosch 500 series dishwasher. Turns out we’d bought a new model. Their own site doesn’t even show that third rack open on that one, but I found a photo somewhere else with it pulled all the way like one would expect. Nothing in the manual. Meantime, he simply called customer service–and they didn’t know either at that hour on a weekend. In the end we simply loaded the front third of that third rack because that was all we could reach of it. (Turning it on at long, long last) What’s this 2:30 thing? Our model doesn’t count down to when the load is finished. Actually, turned out, yes it does. And so we have it going with the ultimate test one could throw at a new dishwasher: can it clean a pan that an angel food cake was baked in that was not presoaked and scrubbed before throwing it in there? No dishwasher I’ve ever had has been able to do that. Time (current reading: 14 minutes left) will tell. And it’s a beautiful, beautiful dishwasher. So far so good. Oh and? Even the floor looked scorched where the heating element of the Maytag had been. We so lucked out. So close. The angel food cake pan is absolutely spotless. Trying to place the name, he asked me, Who’s Chris Hadfield? I started singing Ground Control to Major Tom (I LOVE this video! It’s someone’s repost of the one that was seen 22 million times but only had a one-year license to stay up) and he instantly got it. If you haven’t read Stephanie’s post, please, do, her post is way more fun than mine! Meantime, here, I turned the dishwasher on at 11:00 last night and we were off to bed. At nine a.m. I went to grab my hot cocoa mug out of it–and the door wasn’t quite hot enough to burn my hand but it was getting close and the thing smelled of burning plastic. In disbelief I pulled it open and the white plastic at the bottom below the heating element was scorched. This is a dishwasher that had previously been serviced under a recall for having burned houses down. I immediately unplugged it. Maytag, bless them, when I called, duly noted that we had bought it according to their records in 2007 so of course it was long out of warranty. I expected an argument but instead they immediately offered to send someone out to repair it: the service call and the labor would be on them–they hoped I wouldn’t mind if we paid for the parts that might be needed? Sounded quite fair to me. Although: I will have a tab open on the computer with their own price list/suggested retail for such showing when the guy comes. One can only hope he says it’s repairable. So we came thisclose to burning our house down last night, and when I mentioned it on Facebook my friend India from our Warm Hats Not Hot Heads campaign (where we and others knit hundreds of hats to create a sense of community among members of Congress) said her neighbor actually did get burned out of their house a few nights ago by their dishwasher. Mine is model MDBH945AWB (that last B for black). In case you want to go check yours. It might be a good idea. Yeah, that talk about getting the taxes done so fast? Turbotax e-files the federal form for free but charges $24.95 to e-file the state one, after all they charge for the software. For twenty-five bucks I can make a trip to the post office, thanks, since I was going there anyway. Hearts. And smiley faces? I stared. And here’s another one. Hearts?! Smiley faces?! Turbopunked? Emoticonned? Nah, said he later, probably came from when I got the printer to finally work with the new computers. Must still be a glitch in there somewhere. And it only shows up when we’re doing that one little task, think I. Great. Michelle dropped by and she and I spent some time going through what was missing and what was mutilated and trying to reprint what was needed. No more emoticons but some pages still stayed inexplicably vanished. That was one of the more irritably spent $24.95 ever. But now (unless we hear back to the contrary from Sacramento and the Feds) we are really and truly *done* for this year. Let’s just assume the pristine view we saw on the screen was what they received. You just really don’t want the tax collector’s face to do what mine did when I first saw those printouts. My blog broke last night. The resident geek took a look. Turned out that when I’d been hitting Delete Spam of late, it was simply squirrelling it away like a six-year-old hoarding last year’s rotten Halloween candy in the closet. Thousands of pages of spam and no room for anything more. He did his best and we gave it up and went to bed. And look! My Preview and Publish buttons are back and I think this post won’t vanish into the ether like the attempts last night. And yet people were still arriving, not just me. All weekend, Mel and Kris had wondered where I was and if I were coming. There’s a short video on that link of Mel creating a bowl like mine. I love it and I love what they create and best of all I love them to–oh wait. To pieces is exactly not the phrase to use here, never mind. 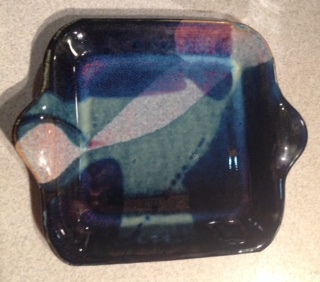 I had long wanted a serving tray in their pottery; they had two left. I bought a few more mugs, since we had found ourselves running low or out while the kids were visiting. A bowl, a gift for a friend. Ohmygoodness. They had toddler mugs. Almost all gone. Oh if only. I had just seen Parker handling one of the regular mugs in person just fine. Mel and Kris had previously told me this could be so, that their boys hadn’t broken things, and I’d answered, But they were raised by potters. Parker raised my faith in the possibilities after all. At the last, I decided I would wait till I see Mel and Kris again at a show in November so I can pick out one set all together. I think I’d still get doubles of each because, y’know, toddlers. That means I’d need six. Let the budget breathe a moment first and besides, they didn’t have that many that late in the show. I intend to see them at the next one early rather than late. It’ll be indoors.